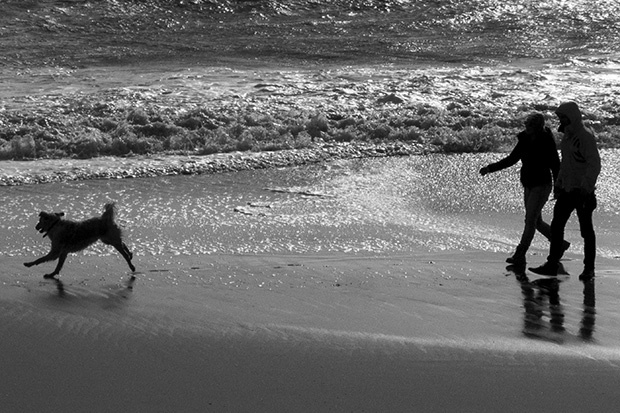 My addiction to taking pictures of dogs walking on the beach with or without their owners shows no signs of abating and neither does my joy at shooting pictures with my Fujifilm X20. When I get to shoot bon the beach with the X20 my photographic life is almost complete (laughs ironically there). So, once again, for no other reason that I loved taking and editing the picture here is a photograph taken last Saturday at Boscombe Manor during a break in the foul weather that the whole of the country has been getting. © Neil Turner, February 2014. A couple walk their dog on the beach between storms. To the north of us was the wreckage of broken beach huts, to the east was an area closed off to the public and to the west was the only stretch of the beach where you could walk with reasonable safety. Happy days. I grew up on the east coast Neil, the camera and the beach go together, bliss!